Antimicrobial peptides (AMP’s) are our first line of defence against invading microorganisms. They are found on all surfaces of the body, including the skin, eyes, lungs, gut and urinary tract. The human body produces multiple different antimicrobial peptides with varied structural features and specifics. The antimicrobial peptides kill the bacteria primarily by destroying the bacterial membranes. The peptides join forces, thus forming an effective and broad front-line defence mechanism that the bacteria must overcome in order to infect humans. Some virulent strains of bacteria (professional pathogens) are able to turn off the synthesis of the antimicrobial peptide arsenal (Figure 1), thus causing infections. Akthelia has identified active pharmaceutical ingredients (APIs) which are capable of inducing the synthesis of the peptides and thus counteract the effects of the bacteria. Akthelia is committed to developing these agents into therapeutic drugs. The proposed antimicrobial treatment is a paradigm shift in the treatment of infections. At pharmacologically relevant concentrations the active ingredients have minimal direct effects on the microbes. The therapeutic effect is manifested when the active ingredient interacts with a viable epithelium, which in turn increases the production of AMPs - the true microbicidal agents. A very important and beneficial feature of this novel treatment method is the low probability of microbial resistance since with the many different peptides induced there is no single solution for the bacteria to avoid destruction. This is in sharp contrast to classical antibiotics where natural selection enriches for the resistant microbial population. Figure 1. 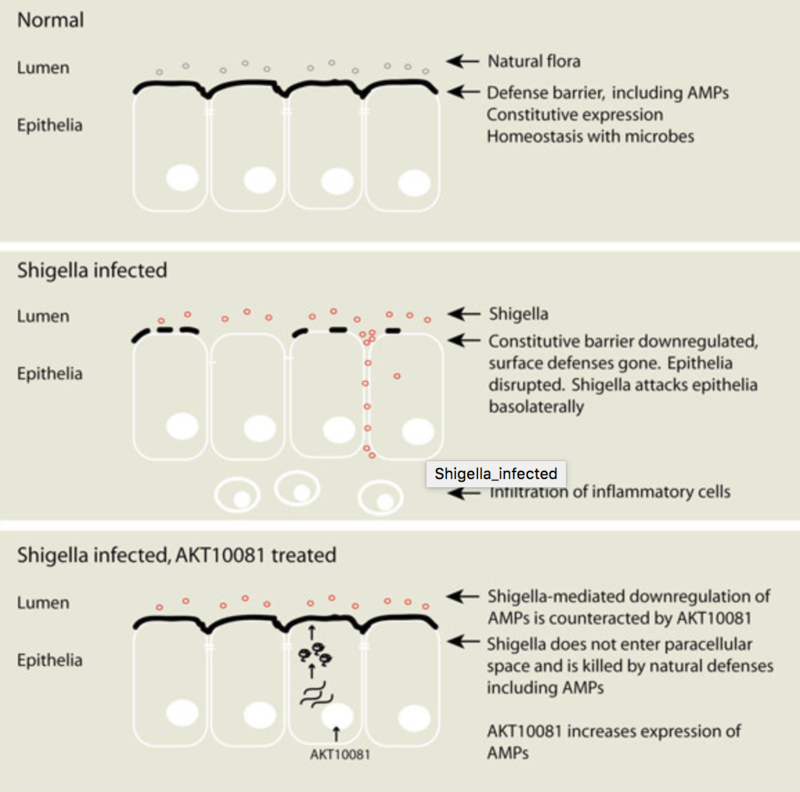 The proposed shut-down of gastrointestinal defences in Shigella infection and reversal with one of Akthelia’s active ingredients. Akthelia’s scientists have demonstrated that certain virulent bacteria severely reduce the host’s AMP defence system during infection and thereby promote pathogenicity. Akthelia has demonstrated that rabbits recover rapidly from life-threatening gastro-intestinal infections when treated with selected API’s, whereas animals in the placebo control group remain morbid or died. These studies also demonstrated rapid elimination of the pathogenic bacteria in stool. Furthermore, the treatment of human dysenteric patients with one of the pharmaceutically active substances identified by Akthelia indicates a promising outcome. Most importantly, a clinical study performed on tuberculosis patients showed that inclusion of one of Akthelia’s actives in the treatment regimen resulted in faster recovery and clearance of bacteria in sputum than in the control group. Akthelia’s actives do this without causing inflammation. Recent studies indicate that certain antibiotics negatively affect the synthesis of antimicrobial peptides, thus providing a mechanism for opportunistic infections. Akthelia’s actives should replace these antibiotics or be included in the therapeutic regimen to reduce the chance of opportunistic infections. Akthelia aims at developing broad spectrum, highly effective oral pharmaceuticals for the treatment of infections. The most important targets are virulent bacterial infections where conventional antibiotic treatment has proved ineffective. Currently, Akthelia focuses on lung infections induced by Pseudomonas aerugniosa and resistant Klebsiella pneumoniae. Akthelia’s founders were the first to isolate and characterize the only currently identified antimicrobial peptide of the cathelicidin family in humans, LL-37 (Gudmundsson et al., 1996), and have elucidated factors and pathways that control the expression and regulation of antimicrobial peptides in ‘in vitro’ cell systems, animal models and humans (Islam et al., 2001, Schauber et al., 2003 and Termen et al., 2008). These results constitute the scientific basis of Akthelia’s business proposition. The Company’s Fundamental Research Group is now dissecting the pathway involved in regulating the expression of antimicrobial peptides to determine how this regulation is affected by infectious bacteria and how drug candidates affect their expression. Akthelia has developed a high-throughput cell-based screening tool to rapidly screen for potential pharmaceutical agents that affect the expression of the antimicrobial peptide LL-37 (Nylen et al., 2014). The cell line has been used to screen chemical libraries (available at the Karolinska Institute) and for developing and selecting a group of compounds which affect the expression of LL-37. This has resulted in the development of an important class of compounds termed Aroyl Phenylene Diamines (APDs) that induce expression of antimicrobial peptides. The company has a matter-of-composition patent on this class of compounds. One APD has been shown to clear infections (Vibrio and Shigella) in animals (Sarker et al. 2017 and Ottosson et al. 2016). The company has shown that these compounds potently activate the production of the antibacterial peptides and in animal models lead to clearing of infections. In human cell lines dose and time of induction has been studied and several innate immune genes encoding beta-defensins, lipocalin and S1008A are induced (unpublished results). Further significant reduction in intracellular Pseudomonas aeruginosa bacteria was observed in an in vitro cell infection model (unpublished), suggesting that further development of the candidate components is warranted in animal models. The compounds are not cytotoxic and they do not induce mutations in an Ames test (unpublished results, performed in December 2017). Akthelia is currently pursuing a program to take this class of actives through clinical testing. Akthelia has shown through proof-of-concept studies that the AMP induction of its compounds is highly effective. In one experiment, rabbits were infected with Shigella bacteria. An inducer or placebo was administered to rabbits after the onset of clinical symptoms. All rabbits that received the inducer survived, while all placebo-treated animals succumbed to the infection (Sarker et al. 2011). In a human trial with one of the inducers, the compound was administered alongside traditional antibiotics against tuberculosis. The addition improved outcome significantly, effectively halving the time needed to achieve an improved clinical score for the patient when compared with treatment with the antibiotic alone (Mily et al. 2015). Most of the prior experiments have been done with 4-phenyl-buturate (PBA also called AKT10081), an orphan drug used for a kidney complication. Akthelia has a utility patent PBA for against infections and has for the time being shelved the development of this compound.